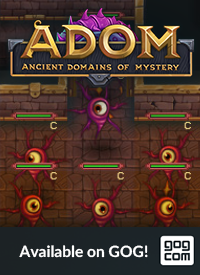 ADOM 2.3.4 still is somewhat rough around the edges and a couple of features are still under development (e.g. the personalized and animated PC sprites). We also expect it to be buggy (comparably to the ADOM 2.3.0 ASCII release). So expect to meet some rough spots - but we strongly believe that it is one of the best releases ever. We now need your support in quickly stabilizing the graphical release in the same amazing way you so far worked on making the ASCII version much better as we now want to do the Steam release as soon as possible to then turn over to much smaller and more regular releases. As usual the prerelease can be downloaded from the usual location. From the flowchart you can see that most of the remaining tasks are now the part that is the biggest fun to me: adding content. I will immediately start adding content (maps, monsters, items, artifacts, quests) from a big pool of notes that has been lying for far too long. 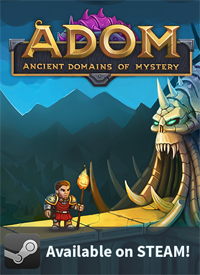 The rest of Team ADOM will continue working on stabilizing the current version in order to get both to Steam and to a general public release. Once we have the next Steam & public release (which will be in October... hopefully sooner than later) we will change our development process to much smaller and more agile releases in much more regular intervals. And then we'll have some more news at the Roguelike Celebration in San Francisco. This is all cool and awesome(without sarcasm, I'm really excited to play new Adom), but I have another question. I know I might be boring (since I'm asking this question from time to time for several years), but do you have any plans for Adom 2? 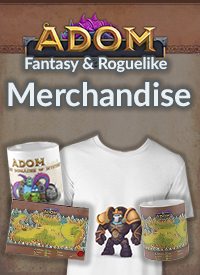 Is there a chance that when Adom Indiegogo campaign goals are fulfilled, Adom 2 will get a little bit of your (and maybe rest of Team Adom) love? Yes, we have ideas and plans. And we will talk about them when we are finished with the ADOM crowdfunding promises. I'd been waiting for the graphical prerelease, but I'm not seeing a download on my portal page after logging in? I've donated at the $40 level cumulatively. That is the right amount for prerelease versions, no? Nope, $40 was the ADOM Lite RPG (which should be delivered by now) and didn't exclude prerelease testing. It included a Steam key that you should see on your account. And as soon as this current version is stable enough we also will be going into beta on Steam. Ah, okay. My mistake. :) Will look forward to the Steam beta. The new graphics are awesome, I can't stop drooling. The new music and sound effects are beautiful too. I think the sound element gets less attention in comments, just because it's harder to give feedback on audio, but I just wanted to say that all the new sound content is very noticable and really adds to the game. Great work everyone! Thanks :-) ! I'll make sure that Lucas gets the extra credits for his compositions - we just love what he does and are happy to hear that others enjoy the audio tracks, too :-) ! I'm extra hyped for this incoming update! Unfortunately I only just recently bought the Steam version(27/09 and I already got 90 hours in) and I don't have access to the pre-release content, but no problem. I've been playing the game ever since the crowdfunding and loving it. Thank you for all the hard work, Thomas and team! Keep it up!